A handmade, contemporary silver ring with gold details, delicate but surprisingly robust, this bestselling piece is classic L&N. 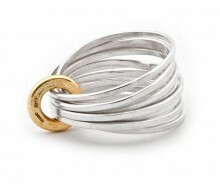 One continuous length of beaten silver, hammered and twisted and bound by an 18ct gold ring of its own. Evoking rain falling on water, it is textured with a soft finish and polished edges to contrast, with the attention to detail you expect from L&N. This modern piece is unique to Latham and Neve. Our design philosophy is Modernist but wearable, cool but comfortable; the finish is exact and every piece is made to be easy to put on and to remove, and to look fabulous. It is entirely British hallmarked silver, hand-crafted in our workshops in the Garden of England. L&N makes everything in the UK, and in the workshop; we use only British Hall-marked silver and gold, and every item is either hand made or finished by our makers. 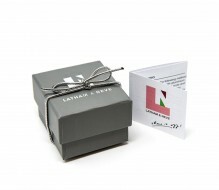 You can wear it for special events, or for everyday; it is adaptable and versatile, and made to be worn! 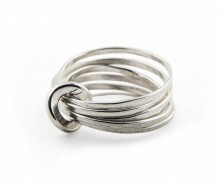 The Ripple Multi Ring comes ready to give in our exclusive L&N gift box, so treat someone special with this beautiful piece. Or just keep it for yourself. For highest accuracy we recommend having your finger measured by a high street jeweller or one of our stockists. Try to ensure your hands are not too hot or cold when you visit. 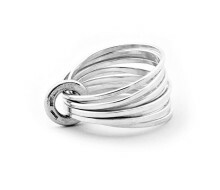 Buying a ring as a gift? If possible borrow a ring from the person you are giving to to have it measured by a jeweller.